Tier 1 has been awarded the ‘Best ADISA ITAD Project’ award for our work with HM Prisons, delivering training to offenders that allows them to gain employability skills. The project aims to reduce re-offending rates and give offenders the opportunity and qualifications to find work. So far over 100 offenders how been involved with the programme with 75% of participants going on to secure employment or work experience. ADISA is an international IT asset disposal accreditation scheme that was founded in 2010. Tier 1 has been an ADISA certified company since 2011 and we are extremely proud to have achieved and maintained a high quality of work that has met their standards since day one, resulting in us being awarded a Distinction with Honors accreditation which is ADISA’s highest level of accreditation. 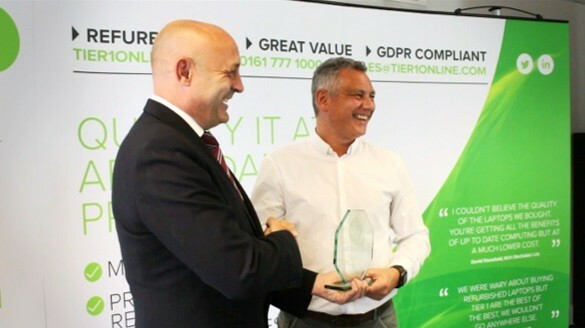 ADISA CEO Steve Mellings recently visited the Tier 1 offices to present the award to our MD, Jonathan Rose.